The Boeing AH-64 Apache is the United States Army's principal attack helicopter, and is the successor to the AH-1 Cobra. The United States Army issued a request for proposals (RFP) in 1972 for an Advanced Attack Helicopter (AAH). From an initial list of 5 manufacturers, Boeing-Vertol, Bell, Hughes, Lockheed, and Sikorsky, the finalists selected were Hughes Aircraft's Toolco Aircraft Division (later Hughes Helicopters) and Bell. Hughes' Model 77/YAH-64 was selected over Bell's Model 409/YAH-63 in 1976. First flight of a development prototype occurred on September 30 1975 but it was not until 1982 that a production contract was signed. In 1983 the first production helicopter was rolled out at Hughes Helicopter's facility at Mesa, Arizona. In 1984 Hughes Helicopters was purchased by McDonnell Douglas for $500 million. Hughes later became part of The Boeing Company with the merger of Boeing and McDonnell Douglas in August 1997. Royal Netherlands Air Force AH-64D at the Farnborough Air Show, 2006. Two major models of AH-64 Apache are in service in the US Army; AH-64A (USAR and ARNG) and AH-64D (Active). An AH-64B variant was designed for naval operation (Marine Corps), but never manufactured. As of 2007 the Marine Corps still uses the AH-1 Cobra. 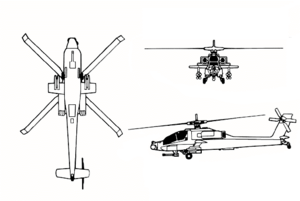 When development of the D model started, the corresponding radarless version initially had the designation AH-64C. However, since the only difference between the C model and the radar-equipped D model was the radar, which could be moved from one aircraft to another, a decision was made to not distinguish between the two versions, irrespective of the presence or absence of the radar. A number of other models have been derived from both AH-64A and AH-64D for export. The British-built Westland WAH-64 (assembled from kits purchased from Boeing) is based on the AH-64D with several different systems, including newer engines. Built to endure front-line environments, it can operate during the day or night and in adverse weather using the integrated helmet and display sight system. The Apache is also equipped with some of the latest avionics and electronics, such as the Target Acquisition and Designation System, Pilot Night Vision System (TADS/PNVS), Black Hole passive infrared countermeasures, nap-of-the-earth (sic) navigation, and GPS. The advanced model, the AH-64D Apache Longbow, is equipped with an improved sensor suite and weapon systems. The key improvement over the A-variant is the AN/APG-78 Longbow dome installed over the main rotor which houses a millimeter-wave Fire Control Radar (FCR) target acquisition system. The elevated position of the radome allows detection and (arcing) missile engagement of targets even when the helicopter itself is concealed by an obstacle (e.g. terrain, trees or buildings). 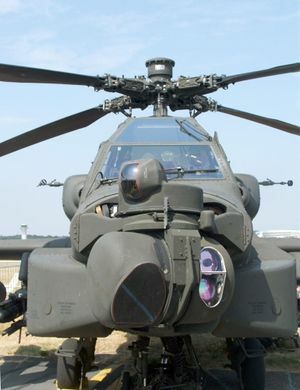 Further, a radio modem integrated with the sensor suite allows a D-variant Apache to share targeting data with other AH-64Ds that do not have a line-of-sight to the target. In this manner a group of Apaches can engage multiple targets but only reveal the radome of one D-variant Apache. 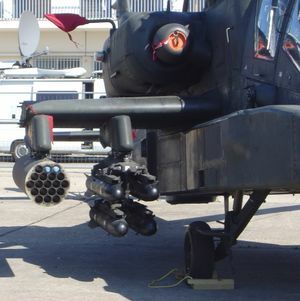 Apaches that include all of the improvements of the Longbow Apache, with the exception of the Fire Control Radar are still designated as "AH-64D Apache Longbows", as the radome is removable and interchangeable between aircraft. AH-64Ds are currently flying in Iraq and Afghanistan without the Fire Control Radar as there are simply no armored threats for coalition forces to deal with. Also, the aircraft was updated with T700-GE-701C engines, and a fully-integrated cockpit. The fusaelage of the aircraft was expanded to accommodate new systems. In addition, the aircraft receives improved survivability, communications, and navigation capabilities. Most existing capabilities of the AH-64A Apache are retained. Hydra 70 and AGM-114 Hellfire. The Apache was first used in combat during the 1989 invasion of Panama, Operation Just Cause. 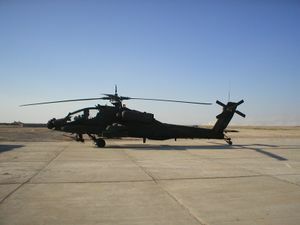 Apache AH-64 and AH-64Ds have played important roles in several Middle Eastern wars, including the Gulf War, Operation Enduring Freedom in Afghanistan, and Operation Iraqi Freedom in Iraq. The Apaches were proven to be excellent tank hunters and also destroyed hundreds of armored vehicles (mainly of the Iraqi army). During Operation Desert Storm, nine AH-64s carrying an asymmetrical load of Hydra 70 flechette rockets, Hellfires, and one auxiliary fuel tank each, and guided by four MH-53 Pave Lows, were used to destroy a portion of the Iraqi radar network to allow bomber aircraft into Iraq without detection. This was the first attack of Desert Storm. Recent reports indicate that the helicopter is vulnerable to ground forces in certain environments, such as when operating in urban terrain. Since 2003, Iraqi ground troops and insurgents were able to damage propulsion and flight control systems with ground fire, sometimes forcing the helicopters to make immediate emergency landings or shooting them down. During Operation Iraqi Freedom, some Apaches were damaged in combat, including one captured by Iraqi troops near Karbala on March 24, 2003, and shown on Iraqi television. The captured helicopter was destroyed via airstrike the day after it was captured. The March 24 attack, against a Iraqi Republican Guard Medina Division's armored brigade, was largely unsuccessful, apparently because the tank crews had set up a "flak trap" in broken terrain, employing their HMGs to good effect. More recently two Apaches were lost along with their crews between January 28 and February 2, 2007 to Iraqi insurgent ground fire in Taji and Najaf. US Army AH-64D provides air support during raid in Remagen, Iraq, February 24, 2006. There are various factors that contribute to this vulnerability. First, Apaches were designed to engage and destroy armor at safe ranges, where they could not be fired upon. Secondly, infantry are less easily detected than armor. In Iraq, the close quarters, and ample cover afforded by the urban environment make it easy for ground forces to attack at close ranges (50 - 850 m). This environment brought out the Apache's vulnerability to close range attacks from heavy caliber machine guns (0.5 inch). Also, since the Apache is only capable of firing at a single target at a time, it is vulnerable when attacked from several dispersed positions. Combat utility helicopters like the UH-60 Black Hawk may not suffer this disadvantage, as they have multiple manned side armaments, adding extra protection in certain tactical situations. However, the Apache has superior maneuverability, armament, and speed. In either case, the Apache's use in both attack and support roles in urban environments has proven effective. Apaches have been successful working in support roles with ground troops, and as an observation platform for directing artillery. Despite the Apache's vulnerability in urban operations, it is currently rated as the most survivable of all military helicopters. The vast majority of Apache helicopters that have taken heavy combat damage have been able to continue their assigned missions and return safely to their bases. For example, of the 33 Apaches employed in the March 24, 2003 attack, 30 were damaged by Iraqi ground fire with several being write-offs, but only one of these did not make it back to base (although in this case, the mission objective was apparently not achieved). The Israeli Air Force uses the Apache as a platform to perform strikes with guided missiles against various targets. The AH-64A attacked and destroyed dozens of Hezbollah outposts in Lebanon during the 1990s, attacking in many weather conditions - day and night. During the al-Aqsa Intifada, the IAF used the Apaches to kill senior Hamas figures, such as Ahmed Yasin, and Adnan al-Ghoul with guided missiles. In the Israel-Lebanon conflict of July-August 2006, two IAF AH-64A helicopters collided, killing 1 pilot and wounding 3, all critically. In another incident in the conflict, IAF AH-64D Longbow crashed, killing the two pilots. Hezbollah claims to have shot it down, but the IAF denies this. The cause is under investigation. The UK operates a version of the Apache called the Westland WAH-64 Apache. Westland has built 67 WAH-64 Apaches under licence with Boeing. The Westland Apache replaces the Westland Lynx as the British Army's tactical attack helicopter. They will operate alongside amphibious forces as necessary and have a folding blade assembly for carrier operations. The WAH-64s are currently deployed in Afghanistan. Royal Netherlands Air Force ordered 30 AH-64D Apaches in 1996, after leasing 12 AH-64As. The radar domes were not included, hence the Dutch AH-64Ds are not referred to as Longbows. Their first deployment was in Djibouti, Africa. They were also deployed alongside US AH-64s in support of NATO peacekeeping forces in Bosnia and Herzegovina. In 2004, Dutch AH-64s were deployed as part of the Netherlands contribution to Multinational force in Iraq. At the same time Dutch Apaches were also deployed to Kabul as part of the Netherlands contribution to ISAF. In February 2006, the Netherlands contribution to NATO forces in Afghanistan was increased from 600 to 1,400 troops and 6 AH-64s were sent in support. AH-64D at the Farnborough Air Show, 2006. The original unit cost for the AH-64A was about US$14.5 million. In September 2003, Greece ordered 12 AH-64D (in addition to the already existing fleet of 20 AH-64A+) for a total cost of $675 million (presumably including weapons and support), indicating a gross unit cost for the AH-64D of $56.25 million. Singapore purchased a total of 20 AH-64D Longbow Apache aircraft in two batches between 1999 and 2001. Pakistan is thought to have ordered 6 Apache Longbow for its various anti-terrorism missions; unofficial reports suggest that the Pakistan Army has a requirement of up to 30 AH-64D Apache Longbow by 2010. In addition to the U.S., Greece, and Singapore, countries which use the Apache include Japan, Egypt, the Netherlands, Saudi Arabia, the United Arab Emirates, Kuwait and Israel. Bahrain, and Jordan have ordered Apaches but deliveries of these aircraft had not begun as of 2006. South Korea had a plan to purchase 36 AH-64D but the plan is presumely canceled caused by fundamental problem. Taiwan has also considered procuring the AH-64D. The Apache has appeared in several movies and video games. ↑ 1.0 1.1 1.2 Boeing AH-64 Apache. Jane's: All the World's Aircraft. Jane's Information Group (2000-10-13). Retrieved on 2006-06-17. ↑ "Downed Apache Blown Up"
↑ CNN: "U.S. Apache pilots taken prisoner"
↑ 4.0 4.1 Fred Chaplan: "Chop the Chopper"
↑ "Iraq fire downed US helicopters"
↑ "Israeli Army Probing Helicopter Crash"
↑ "Boeing Delivers 30th AH-64D Apache to Royal Netherlands Air Force"
↑ government.nl news archive "Six Apaches to Iraq to boost security"
↑ "More Dutch troops for Afghanistan"
AviationExplorer.com: Brief technical information about the Apache. 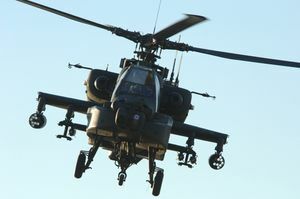 HowStuffWorks.com Overview with supporting images of the Apache Helicopter. This page was last edited on 5 March 2007, at 09:10.